"Darrach's Procedure." Wheeless' Textbook of Orthopaedics Page. http://www.medmedia.com/ooa1/119.htm. Fascia — Thin connective tissue covering or separating the muscles and internal organs of the body. Rheumatoid arthritis — A joint disease of unknown origins that may begin at an early age, causing deformity and loss of function in the joints. plastic repair of a joint; called also joint replacement. total hip arthroplasty replacement of the femoral head and acetabulum with prostheses (femoral and acetabular components) that are anchored to the bone, done to replace a severely damaged hip joint. A, Total hip arthroplasty. A cementless prosthesis allows porous ingrowth of bone. B, Total knee arthroplasty using a tibial metal retainer and a femoral component. The femoral component is chosen individually for each person according to the amount of healthy bone present. From Polaski and Tatro, 1996. Called also total hip replacement. Patient Care. The most frequent complications to guard against in these patients are infection and dislocation. An interdisciplinary team helps the patient with recovery and rehabilitation after surgery. Before surgery patients are given instruction to assure that they understand the nature of the surgery, its expected outcome, procedures and exercises that will be done postoperatively, and the correct use of aids to ambulation such as a walker, crutch, or cane. In addition to routine postoperative care to avoid respiratory and circulatory complications, special care must be taken in positioning the patient. In order to prevent subluxation (dislocation) of the prosthesis, an abduction wedge is secured between the legs (usually in the operating room) and left in place until removed by the surgeon. The head of the patient's bed should not be raised more than 45 degrees. Patients usually are allowed to stand at the bedside the first postoperative day, supported by a walker and two persons. Specific written permission for weight-bearing on the affected joint should be obtained from the surgeon before this is allowed. Patients often need additional instruction and help in transferring from bed to chair, wheelchair, and commode. Whenever a sitting position is assumed, the chair seat should be raised so that the hips are not flexed beyond a 90-degree angle. Discharge planning should include instructions that will enable patients to care for themselves safely at home. These include: (1) It is safe to lie on your operated side. (2) For three months you should not cross your legs. (3) Place a pillow between your legs when you roll over on your abdomen or lie on your side in bed. (4) It is safe to bend your hip, but not beyond a right (90-degree) angle. (5) Faithfully continue the exercise program started in the hospital. Patients who need assistance in self-care are referred to a home health agency, social worker, or community health nurse. total joint arthroplasty arthroplasty in which both sides of a joint are removed and replaced by artificial implants anchored to the bones; the most common joints treated are the hip, knee, elbow, and shoulder. Called also total joint replacement. total knee arthroplasty arthroplasty of both sides of the knee joint, with tibial, patellar, and femoral components. 1. Creation of an artificial joint to correct advanced degenerative arthritis. 2. An operation to restore as far as possible the integrity and functional power of a joint. /ar·thro·plas·ty/ (ahr´thro-plas″te) joint replacement; plastic repair of a joint. 1. The creation of an artificial joint. 2. The surgical restoration of the integrity and functional power of a joint. the surgical reconstruction or replacement of a painful, degenerated joint, to restore mobility in osteoarthritis or rheumatoid arthritis or to correct a congenital deformity. Either the bones of the joint are reshaped and soft tissue or a metal disk is placed between the reshaped ends, or all or part of the joint is replaced with a metal or plastic prosthesis. Preoperative care may include the typing and crossmatching of blood. After surgery the patient may be placed in traction to immobilize the affected limb. Physical therapy to increase muscle strength and range of motion is allowed in a slow, progressive schedule. When a lower extremity is involved, weight-bearing may or may not be allowed. Frequent checks of distal circulation are made and the nurse watches for bleeding, thrombophlebitis, pulmonary embolism, or fat embolism. Antibiotics are usually given to prevent infection, which is the most common cause of failure of the surgery. Also called joint replacement. See also osteoarthritis. Surgical repair of a joint. See Implantation arthroplasty, Total hip replacement, Total knee replacement, WOMAC. 1. Creation of an artificial joint to reduce pain and/or restore mobility to a joint. The surgical creation of a new joint or the insertion of an artificial joint. Total hip joint replacement is a common example of arthroplasty. The operation is done to restore mobility, and relieve pain and deformity. 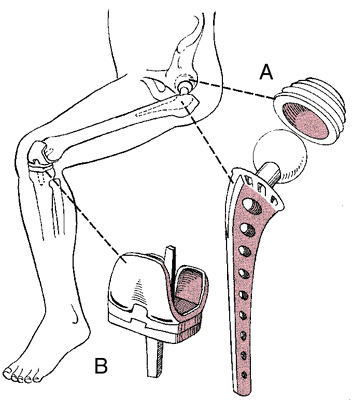 Problems may arise from loss of firm fixation and mechanical wear of the prosthetic parts. surgical remodelling of a joint. 1. Creating an artificial joint to correct ankylosis. 2. An operation to restore the integrity and functional power of a joint. n the surgical correction of a joint abnormality. plastic repair of a joint. The functional outcomes of total knee arthroplasty. 7 They had one inpatient mortality and found that 90% of their major complications occurred within 4 days of the index arthroplasty. Now some of the patients with severe osteoporosis or comminuted intertrochanteric fracture are treated with arthroplasty. The new study is among the first to assess how BMI affects the risk of complications after shoulder arthroplasty. Studies on total knee arthroplasty (TKA) report that consideration of lifestyles and cultural and gender differences were important in terms of patient expectations and satisfactions (11, 15). Does Gender Affect Satisfactions of Patients with Total Hip Arthroplasty? An increasing number of knee arthroplasty is performed every year. Lot of research studies and publications have been done across the world comparing the cemented and uncemented THA and were of the opinion that Uncemented Total Hip Arthroplasty is one of the best procedures for the advanced Osteonecrosis of hip with arthritis. RSA and TSA are high cost procedures (estimated use of primary shoulder arthroplasty increased to 67,184 cases in 2011 (13)), and surely will come under hospital scrutiny. Treatment comprised gap arthroplasty, removal of the deformed meniscus and condylar fragment, and replacement of interpositional material with alloplastic material of Silastic. Resection arthroplasty, arthrodesis and amputation are other treatment methods [37, 17, 52, 2, 44].